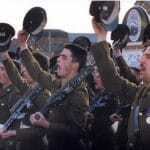 To mark the 300th anniversary of the founding of Gibson’s Regiment in 1694, which became the 28th Foot in 1758 and then, in 1881, The Gloucestershire Regiment, the Regiment held a series of parades throughout Bristol and Gloucestershire over 5 days in March 1994. First, however, there was a rugby match; then, a Regimental Party in a hangar at RAF Quedgeley where nearly two thousand serving and retired members of the Regiment and their families sat down to lunch and then partied. The celebrations culminated in a Service in Gloucester Cathedral, a march through the City, with the streets and even the roofs crowded, to a final parade in Gloucester Docks. After the Colours had been marched off parade to the Museum, where they remain to this day, the Battalion marched off for the last time. A month later the Royal Gloucestershire, Berkshire and Wiltshire formed at Catterick. The Glosters were never found wanting.